1. A bent or twisted crankshaft cannot be repaired. If the connecting rod journals are scored beyond repair or worn beyond the limits in the “Specifications” section, replace with a new crankshaft or regrind the connecting rod journals. Service insert bearings are available at 0.25, 0.50 and 0.75 mm (.010, .020 and .030 in) undersize. 2. If the main bearing journal on an air compressor, which has a sleeve main bearing, is scored excessively or worn beyond the limits of the “Specifications” section, it must be replaced. No undersize bearings are available. 3. Keyway, threads and all ground and machined surfaces must not be damaged or worn. 4. 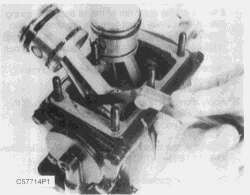 Crankshaft oil passages must be cleaned to ensure oil flow. 5. Examine the ball bearings for worn or damaged balls; rotate the ball bearing by hand to detect roughness. If wear, roughness or damage is evident, the ball bearing must be replaced.